There is always that hope in me to start my own business. At the age of 19, I quit university to start a life insurance career. I closed one deal and made a whopping $600 something dollars in 1.5 years. The only reason I got that deal is that my parents felt bad for me and bought a policy. After racking up thousands of dollars in credit card debt and got into 2 car accidents from being on the road, I finally realized that business was not for me and gone back to finish my degree. I went back down the path of trying to be an entrepreneur at the age of 27. I had an idea to start a platform allowing people to list their parking spots up for rental/buy/sell. The idea attracted a developer to start working on a minimum viable product. It took nearly a year to develop the MVP and just before launch, we realized that it would cost $10k to deploy the app on the platform we used. We weren’t able to justify the cost as a few highly similar competitors already launched by that time with a significantly better feature. We ended up having to kill the project and gone our separate ways. I continued exploring other ideas for the startup. I tried GPS-based wearable baby clothing, digital artwork shopping site, wedding-related vendor quoting platform, and even livestock feed import. Obviously, none of them went anywhere. And… Here I am again, starting another startup project. This time, I decided to do something a little different. I want to document my entire journey of founding this venture and share my story whether it succeeds or not. As for background information, the startup project I am working on is called nodis.io(we are still in prototype stage). It is a social media marketing platform that aims at helping local retailers to interact with local communities. As a marketer myself, I find it to be a constant struggle to figure out ways to engage with end-user customers. Research showed that it is even more difficult for the startup & smaller businesses with a limited marketing budget and online presence. Our platform allows businesses to post Challenges for the community to participate. Participants are rewarded with tokens, which can be used to purchase product/service vouchers on our website. The goal is to create higher exposure, more engagements, and more leads for the local retail businesses. 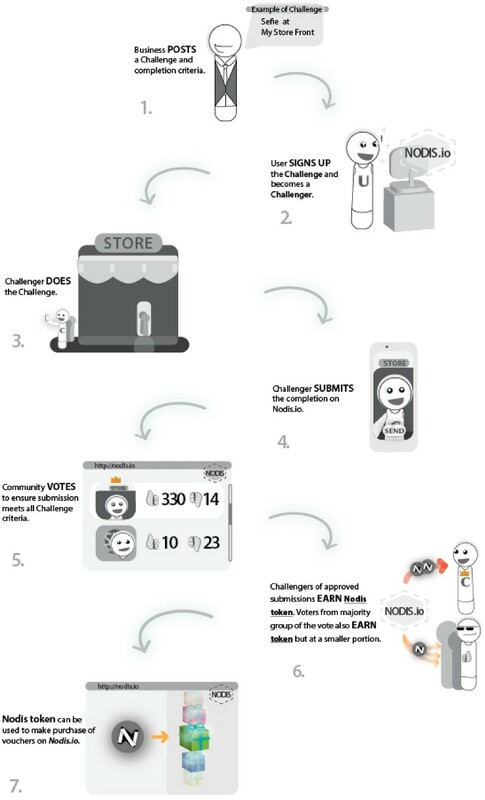 As an illustration of how we are looking to achieve that, you can see below for a glimpse of our Challenge system and how businesses can interact with the local users. nodis.io is built heavily on our research and the market needs. The difficulties that local retailers are facing are serious. They are often pressured by major corporations such as Wal-Mart or Amazon. We aim at creating a service that will give them a better fighting chance through incremental exposure. Validating the market with an actual product (sort of) — actually going door-to-door with local retail businesses to demo the MVP (minimum viable product). This is a series write-up by Will Chen, you can read 2nd chapter of this series here. Meanwhile, you can visit nodis.io to see what they have built so far. Keep in mind that this just a prototype so the functionality is limited and there are probably lots of bugs. You can comment your feedback regarding this write-up or his startup product in the comment section.